The famed Mamer Racing team continued their winning ways by putting Aaron Mamer atop the Fast Fours standings for the first time. After many championships with his dad, Jeff, behind the wheel Aaron strung together three victories in 2012 en route to earning the NSRA Fast Fours championship. Driving the trademark “Sidewinder” chain-driven Pauter-powered Dragster, the 19-year old Brawley, CA driver ran a season best ET of 2.85 seconds at the Soboba season finale. Aaron would like to thank his Grandpa, Tio O.T., and the rest of his family, especially his Dad for all of the help and expertise throughout the years. His most memorable moment was a wild ride getting up on two wheels at the Dome Valley season opener. Thankfully Aaron used some great driving to save the car and continue on to the season championship. Look for the Sidewinder team in 2013 as they lead the Fast Fours class into a new season of racing. 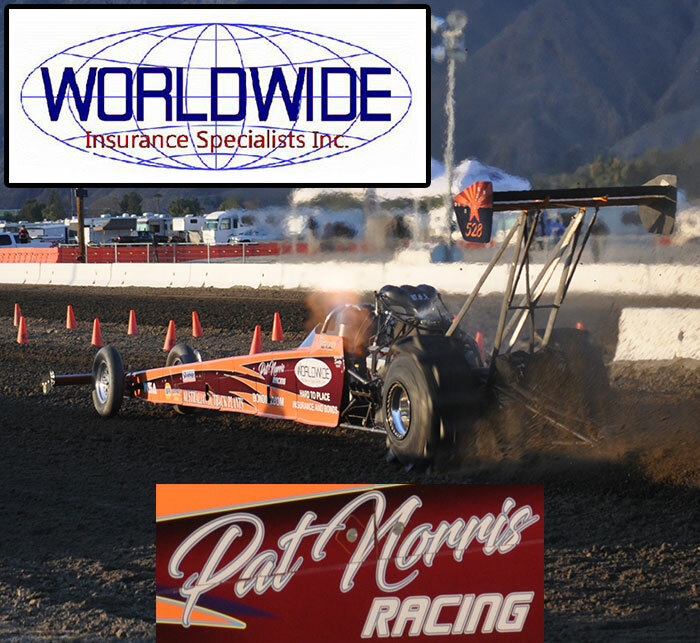 Fresno, CA’s Gary Mink earned his fourth consecutive championship in the Top Alcohol class in 2012. Running in the NSRA series, Gary scored four victories on the season along with two runner-ups. He was in the final round at all six races over the course of the season. 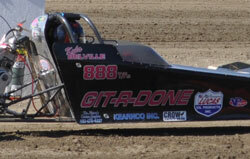 Gary also ran the Quickest Top Alcohol ET of 2012 with a 2.426 at Dome Valley Raceway in February. His crew Justin and Julie kept him going all season long ending 2012 with a win at Soboba in November. Gary would like to thank Boghosian Racing Engines for all of their help. Look for the “Bad to the Bone” team in the Top Alcohol class going for five class championships in a row in 2013. Billy Morris and the Morris Family Racing team finally broke through in 2012 to win the NSRA Top Eliminator class championship. This team had won a Super Eliminator championship, but came up just short in TE on a few different occasions. In 2012, everything came together for MFR with four victories and two runner-up finishes. They also had a perfect TE run of 2.950 at Soboba in April. The 28-year old driver from La Quinta, CA had huge support starting with Team Owners Rick & Shelly Morris as well as crew chief & 2012 Top Fuel Drag Boat champion Eddie Knox along with a dedicated crew including Mike Dickherber, Jon Montez, Joe Jiannoni, Frank Lucia, and Clayton Blake. Sponsors of the team included Red Line Oil, LED West, Eddie Knox Racing, MFR, and Dan Chittenden Race Cars. Billy would like to thank all of these folks for their contributions to this huge championship season. His most memorable moment of the season was the last race, which was his son Bradley’s first ever race, being just one month old. Having the whole family there was a boost to the Morris team, who reached the final round before losing a tough breakout decision by .001 (2.949 on a 2.95 Index). Billy says those tough losses are hard to forget, but provide motivation for next season. This team will be back in 2013 looking to repeat as the champions in one of the toughest categories on sand. 14-year old Kyla Belville captured her first Junior Dragster class championship during the 2012 NSRA point series. The Chandler, AZ resident scored three victories over the course of the season, including a huge win at Soboba in May over one of the largest Junior Dragster classes in history. Kyla started racing at age 7, and has continued on her winning ways ever since winning the West Coast Nationals at the AVI in only her second year of racing. Her crew chief and dad, Johnie has been by her side the whole way. She would like to thank both her dad and mom (Teri) for all of their support over the years. Kyla has already talked to her dad about a full size dragster to move up to the adult classes in the near future. Don’t be surprised to see her continuing to the visit the Winner's Circle in the years to come. Texas racer John Acker has been a life long mud racer, but in 2012 he certainly made a splash in the sand drag world. Acker, living in Killeen, TX, dominated the 2012 Mid-America Sand Drag Series by winning three of the four events in the Pro 1 Cars class. Driving a tube chassis rear-engine “Mud Truck” owned by David Riddle, and built by John in his own shop, Acker was deadly consistent ET wise and killer on the tree. The 385 cubic-inch SBC between the frame rails made consistent power to run in the low 4-second range. John’s most memorable moment of the season was winning both the Quick 16 & Pro 1 class at the MASD season opening Heartland Nationals at Atoka Motorsports Park in Atoka, OK. The “Team Mud” crew followed the journey to the championship along the way as John was supported by his great friends David Riddle, Paul Bates, Michelle Bates, Abigail Bonham, and daughter Brianna Acker. The main sponsor for Acker’s championship season was Ron’s Automotive and Machine Shop. John wants to thank Atoka Motorsports Park and Thunder Valley Sand Drags for hosting the great Mid-America Sand Drag series events as well as Lonestar Graphics for their great support of the sport with amazing pictures, plaques, and T-Shirts. 17-year old Luke Martin showed nerves of steel as he closed the deal on the 2012 Mid-America Sand Drag Series Pro ATV class championship. Luke led from the start of the season with a win at the Season Opening Atoka event, and then survived an amazing round-by-round battle with Mollie Eades at the season finale to take home the title. Martin, a Clarksville, TX resident, rode his 86” rigid GT frame with a 4-Mil Cub to the winner’s circle running consistent 4.0 second ET’s. Luke’s dad, James, was right by his side the whole time as he also finished in the Top 5 of the point standings. Other crew members for Luke include Jason Weems and Darren Childress. He would also like to thank K&T Performance, Performance ATV & Cycle, and HRI Powersports. The most memorable moments of the season for Luke were winning Pro ATV at the Heartland Nationals (MASD Season Opener) and recording his first ever 3 second pass. Luke definitely will be a top contender in the ATV classes for many years to come. Shocker Racing’s Matt Ewing is no stranger to the Winner’s Circle, and he made himself quite at home there in 2012. 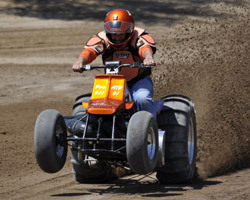 The 29-year old Byron Center, MI resident rode his 1000cc Thundercat Snowmo-powered custom frame ATV to both the Pro & Sportsman point series titles at West Michigan Sand Dragway in Mears, MI. Matt showed great poise through the grueling 11 race point series as he fended off tough competition from top racers, such as his father Steve Ewing and 2nd place in Sportsman series Tom Hartman Jr. Matt received great support from his dad, Steve, as they race together as a family towards the Winner’s Circle. 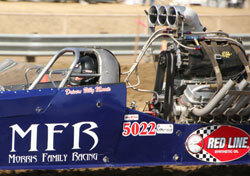 Some of the supporters of Shocker Racing include Cascade 4WD, Usher Tool & Die, and Flannery Engines. Matt had several memorable moments on the season including winner both point series, defeating his dad in the final of the Big Bud race, winner the Sand Nationals heads-up ATV Shootout as an under dog, and winning the Triple Threat award for winning three classes at the same event. Wherever Shocker Racing goes, you know they will always be a threat for win. Perhaps the best season of all the champions in 2012 belongs to Garden Grove, CA resident and long-time racer George Amos. George managed a feat rarely seen as he won both the Pro 2 and Motorcycle Pro 2 categories in NSRA series competition. You may think that seems easy winning two classes, but George won racing two distinctly different types of vehicles. 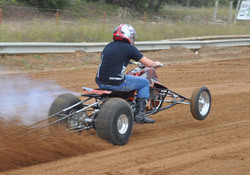 George drove his 510 ci Spitzer Dragster to four victories on the season while he also rode his trademark Trinity Racing 3-Wheeler powered by a 250 cc Honda to two victories in the Motorcycle Pro 2 class. Even bigger was that at the April & May Soboba races, George doubled up winning both classes on the vastly different vehicles. That shows major versatility as a driver. George has a long list of sponsors to thank including Veteran Ed’s Water Damage Specialists, Amos Drywall, Premier Auto, Trinity Racing, Port Magic Racing, Frederosa Racing, and Lopez Plumbing. He would also like to thank the folks that help him get down the track every time; Harry McDermott, Craig Spencer, Rob Main, and Jim Williams, who does George’s motor work in the Dragster and is currently freshening it for the 2013 race season. George’s most memorable moments were the aforementioned Soboba events where he managed to win with both the Dragster and the ATV. Look for George to be a front runner again in 2013 as he approaches racing a little differently. George plans on retiring his trademark Trinity Racing 3-wheeler and concentrating on running Pro 1 & Pro 2 with his Dragster. With the success he saw in 2012, there’s no doubt he will be battling it out for the title again in 2013. Palm Desert, CA’s Mark Ratliff once again proved to be the class of the field in the Motorcycle Pro bracket classes in the NSRA series in 2012. Ratliff held off a hard charge from Christian Payne across the final few races to win both the Motorcycle Pro 1 and Motorcycle Sportsman 1 class titles. 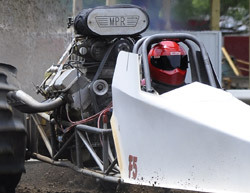 The 51-year old racer was proud to repeat in two classes after he won three class titles in 2011. Racing is a family affair for the Ratliff’s as Mark races with his sons Garrett and Austin by his side as well as his brother, Bill Weir. These guys comprise the formidable MPC Racing team. Mark also picks up support from Rub Dubs Racing. Looking forward to 2013, the MPC team plans to hit it hard again with their Yamaha ATV’s as son Garrett returns to the track to challenge his dad for the championships in the NSRA series. These guys know how to race, and odds are good they will be around when the cash is on the line. Veteran Phoenix area campaigner Keith Ahart had another big year in 2012 as he raced to the NSRA Pro 1 class championship. Ahart, driving his 540 ci BBC-powered “Second Urge” Dragster, picked up one win in three Pro 1 finals on the season, but that was enough to hold off hard charging Bob Cambridge for the title. Keith also picked up big wins at West Michigan Sand Dragway and Atoka Motorsports in his 2012 travels. Always by his side is his wife Carolyn, who is always a big part of her husband’s winning ways and is regarded by many as one of the best Bracket crew chief’s in the country. Their team is backed by Ahart Properties. Keith says his most memorable moment was winning the final round of the Pro Gambler class at the October Avenal race in the dark. He lined up against April Soares with very little light on the track, and was able to somehow find his way to the Winner’s Circle. The Avenal events as a whole were a highlight of the season for Keith with great hospitality from the Central California group. You never know where Keith may show up to race at, but you know odds are good that the “Second Urge” Dragster will still be in contention late into the night. Independence, MO’s Jeff Sieg used his years of racing experience to win the first ever MASD Top Eliminator class championship. The 52-year old veteran of the sport had a good start to the season with a runner-up at Atoka, but would switch to his brother Stacey’s Dragster after hurting his own car in testing for the second half of the season. Jeff had a semi-final finish at Thunder Valley before dialing the borrowed car in to a big win at the Atoka Season Finale, which also sealed the deal in the MASD championship battle. Jeff’s home built 280” Dragster chassis is powered by a 649 ci Blown Alcohol engine. Sieg Construction backs the operation while Jeff’s right hand man / crew chief Russ Payne keeps the car going down the track. 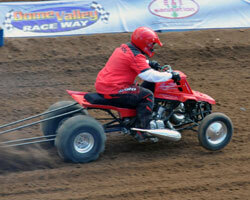 Jeff is not only a racer, as his family owns and operates Thunder Valley Sand Drags in Grain Valley, MO. Being a part of a race track, he knows the business and wants to thank all involved in keeping sand drags going. Jeff’s highlight of the season was seeing Rod Trower break the track record at Atoka Motorsports Park after many years of trying. 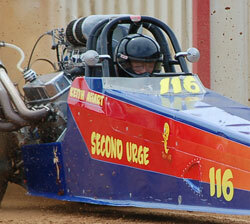 The Sieg family loves their sand drag racing and look for Jeff to continue his winning ways for many years to come. Independence, KY racer Kyle Harney has been a big supporter of the Pro Truck Nationals (PTN) series over the past few seasons, and 2012 saw him break through with his first ever Pro Truck championship. 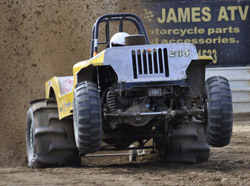 23 year-old Harney wheeled his “Hayshaker” CJ-7/Willys-bodied Jeep with a 434 ci Naive Racing engines powerplant through two grueling nights of racing at PTN Championship Weekend 2012 to take the title. Making this battle even more dramatic at Little Sandy Raceway in Grayson, KY was that there was a 3-way tie atop the point standings necessitating a race off the determine the champion. Kyle says this was by far his most memorable moment of the season, defeating tough competitors Jeff Banks & Rodney Upchurch in the race-off to take home the hardware. Richard “Grandpa” Harney and the Wilson Steele Connection crew were alongside supporting Kyle the whole way. Kyle lists his sponsors as Harney’s Service Center and the Wilson Steele Connection Racing team. He would also like to thank all of the sponsors/supporters of PTN for keeping things going and the sport growing over the years. Kyle will certainly be a great champion representing the sport in 2013.